La Tourangelle Pan Asian Stir Fry Oil, begins with expeller-pressed safflower oil infused with stir fried onion, garlic and ginger flavors. Deliciously blended flavors of stir fried onion, garlic and ginger with expeller-pressed safflower oil, La Tourangelle Pan Asian Stir Fry Oil makes it quick to create a wide range of tasty Asian dishes anytime at home. Try sautéing meats, vegetables, noodles or rice with this Pan Asian stir fry oil, or drizzle right before serving for wonderful flavor. La Tourangelle is one of few remaining oil mills keeping a time-honored French heritage of roasting and pressing nut kernels into delicious oils. We are a family-owned company whose mastery of oil production is the fruit of passion, integrity, and pride. We strive to be the best artisan oil producer, dedicated to making carefully crafted, sustainable, natural products. With artisan care, we extract the seeds’ essence and hidden natural treasures to create amazing products that bring delight in the kitchen and well being for the body.QUALITY YOU CAN TASTE: La Tourangelle brings artisan excellence to your kitchen and home. The mainstay of all La Tourangelle’s natural, artisanal oils is premium taste derived from the best quality ingredients. Add the flavor of La Tourangelle to any meal. 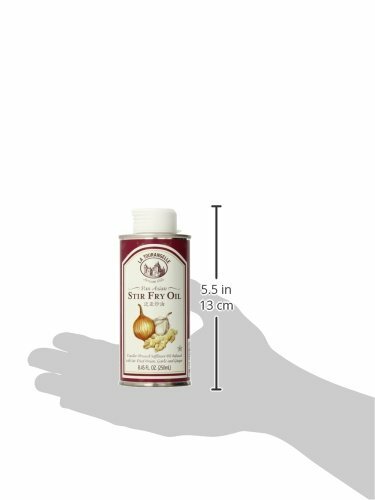 WITH DELICIOUSLY BLENDED FLAVORS of stir fried onion, garlic and ginger, La Tourangelle Pan Asian Stir Fry Oil is perfect for creating a wide range of tasty Asian dishes and enhancing any culinary creation with delicious savory flavors.